Marshall Middle School in Scripps Ranch receives the least amount of extra subsidies for poorer students and parent donations, and yet it has found success. How? John Rick works with students in his class at Thurgood Marshall Middle School. To get a glimpse of where the San Diego Unified school board wants to take the rest of the district, go to Thurgood Marshall Middle School in Scripps Ranch – a school that gets less money from donations and government subsidies than almost any other school in the district. 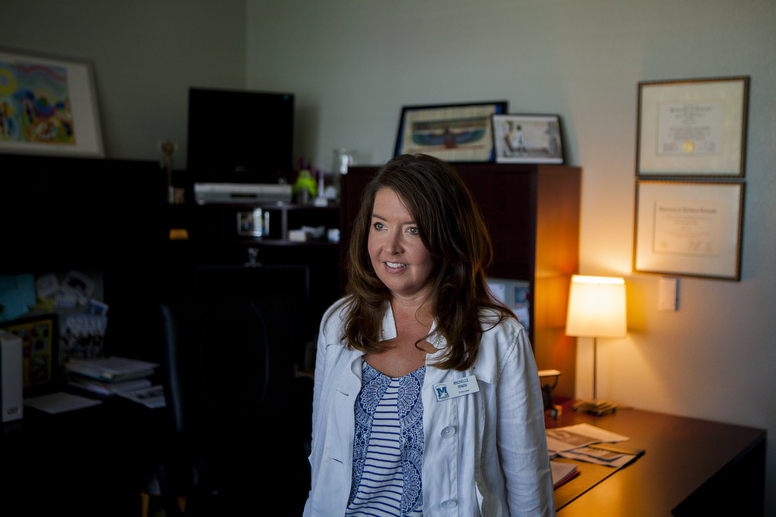 Its principal, Michelle Irwin, is finding success even without the extra financial support. Test scores are higher than any other middle school in San Diego Unified. Marshall is an in-betweener school. It serves around 200 English learners and students from low-income families, but that doesn’t generate enough extra subsidies to pay for support teachers or programs. On the other side, it has a Parent Teacher Association which raises money, but only a fraction of the $787,000 one La Jolla school raised in 2011. Just to compare, to help with poorer students, Knox Middle School in south San Diego received more than $1,000 in supplemental government money per student in 2011. Pacific Beach Middle School, which got some money from the government and raised more through donations, got $450 extra per student. Marshall saw $74 extra that year. Without help from the PTA, Irwin says she wouldn’t have enough money to pay for supplies in her classroom. “Without them, I’d be running in the red, and I’d probably lose my job,” Irwin said. Class sizes range from 30 to 36 students; she can’t afford a full-time nurse or librarian. Yet last year, students here had an API score of 934, a composite score based on standardized tests. The district’s average was just over 800. To take a closer look at what was happening, I visited Joey Lepetri’s classroom. Lepetri was a 2012 teacher of the year, and teaches language arts and video production. Instead, you see a breakdown of the Common Core standards – a roadmap for students. The cabinet tops are decked out with monster heads, busts of kings and queens – all props from the work students have done in video production. Students were paraphrasing a short story, putting the author’s sentences in their own words and relating them to their lives. It looked like learning. And the test scores back it up. So it comes back to a question: At least for students at Marshall, achievement doesn’t come down to extra funding. So what does it come down to? Teachers at Marshall are more experienced than the average district school. Students here, in general, come from families of means and parents are engaged. The district is focused on finding a way to replicate success like Marshall after it grew disillusioned with the school reform movement, which focuses intensely on test scores as a way to gauge progress, and is now looking for a measurable alternative. Real progress is made at the grassroots level, district leaders now believe, a process by which each school is enlisted in that change and solutions grow from the bottom up. But test scores are still the clearest way to measure which students and making it. Marshall might offer a piece of the puzzle on how to raise them. I sat down with Irwin to ask her some of those questions. Here’s an edited portion of that conversation (my questions are in bold). It’s safe to say this is one of the pockets of success that (Superintendent) Marten talks about. How do you make that happen? You’re starting to sound a lot like Marten. Really, it’s work. Constant work. It’s like a marriage – if you stop working at it, it’s going to die off. I’m always asking myself what I could be doing differently, what I could be doing better. I’ve taken that on as my mantra, and I’ve seen that spilling over into our teachers. (Teachers and I) don’t just talk about what students will need to get through middle school, or what they’ll need for high school, but the 21st century skills they’ll need to be a literate adult. We talk about the achievement gap that happens when they get to college. We don’t want to prepare them to get into college; we want to prepare them to do well in college. How did you create a culture where they’re pushing for excellence, so to speak, along with you? I try to tap into their intellect. Great teachers are great students, and they’re curious. As part of professional development, we don’t just read textbooks, we read work that challenges our approach to teaching, and gets us to think about whether we can improve. (For examples, pulls out The Global Achievement Gap and Drive: The surprising Truth for What Motivates Us). I want us all to think of the deeper questions – like how do we teach kids that it’s okay to fail? And how to learn from those failures instead of curling up in a fetal position? How do we teach their parents that it’s okay to fail? How do you respond to the argument that what you’re doing might work well for you here, where most of your kids come from families of means, but it would be a different game in a high poverty neighborhood? We still need to give them the opportunities to think critically. The minute we say they can’t do something because of where they come from, or what reading level they’re at, we’re part of the problem that causes that divide. How do you use data and test scores to measure student progress? Tell me about the role data plays, or should play? I see data as one of many things to measure effectiveness. Kids are not like cars, you can’t just tweak an instrument and everything runs smoothly. You can’t just look at one test like the (California Standards Test). You really have to look at multiple measures. One of the messages we get from Cindy Marten is that’s it’s not all about test scores. And I find that really refreshing. Testing can consume a school with the test prep and actually administering it, and I think we miss out on actual learning. When I look at data, I dive deeper. I look at how they’re doing on student work, test scores. I think of things like whether our classes are rigorous. Are they problem solving, thinking critically? Do we use data, yes, do I value data, yes, but it’s not the only thing we use. But how do you measure things like critical thinking or problem solving? Well, I go into classrooms. The other day I stepped into a math class where students were using Pythagorean Theorem to measure pixels in cell phones and trying to weigh whether Apple’s claim is right, that their cellphones had more pixels. Kids were arguing, they were engaged, and I knew if they were able to do this, if they see this on a test a month from now, they’re going to be just fine. So it sounds like that part falls on the teacher. How do you know if a teacher is meeting his or her potential? Through multiple measures, just like for students. I can stop in their classroom and see how they’re leading class, whether they’re building rapport with students. You can see that. And there’s professional development. We recently went to a conference where we were talking about teaching techniques. A teacher came to me later and said she really wanted to try some of the techniques that we’d learned, and asked if I’d come by her room to see how she was doing. That’s where I have to build that trust with the teacher and let them know that it’s okay to take on new things. It’s okay to fail once in a while. I don’t want to talk about test scores, because in the end, if we’re doing our lessons right, those test scores will come through. It seems sort of counterintuitive in a way, right? You’re able to raise test scores by not focusing on test scores. Yes, absolutely. I say to my teachers that we are one of the lucky ones, because our scores are so high and because we don’t get federal funding. That means we’re not under the testing microscope. When I got into teaching, before I became a principal, I didn’t get into it to make a kid pass a test. I wanted to help them become a better citizen; I wanted to inspire curiosity.